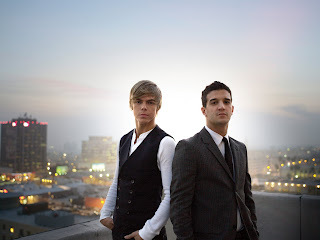 If you're a fan of Mark Ballas and Derek Hough from "Dancing With the Stars," you'll be pleasantly surprised to find they can sing as well as they can dance. Their group, The Ballas Hough Band, has released a new CD titled BHB. BHB showcases their talent with sounds ranging from funky ("Do You Love Me") to smooth ("Longing For") and everything in between. And with clean lyrics, you don't have to worry about playing the songs in front of your kids (in fact, they'll probably be singing right along with you). Thanks to the One2One Network, I was able to review BHB. The wide variety of sound is what appeals to me most. "Birthday" reminds me very much of Prince (whom I love), while "Fall" has an All American Rejects sound. My favorite, "Do You Love Me" will remind you of Maroon 5. In fact, it's hard to put their music into any one category. Pop? Check. Rock? Check. Jazz? Check. BHB really covers it all. Reality t.v. fans should know that their catchy tune "Do It For You" was co-written by American Idol judge Kara Dioguardi. So you're getting a little bit of American Idol with your Dancing With the Stars when you listen to this CD. Click here to check out the official Ballas Hough Band website, and here to purchase the BHB CD.